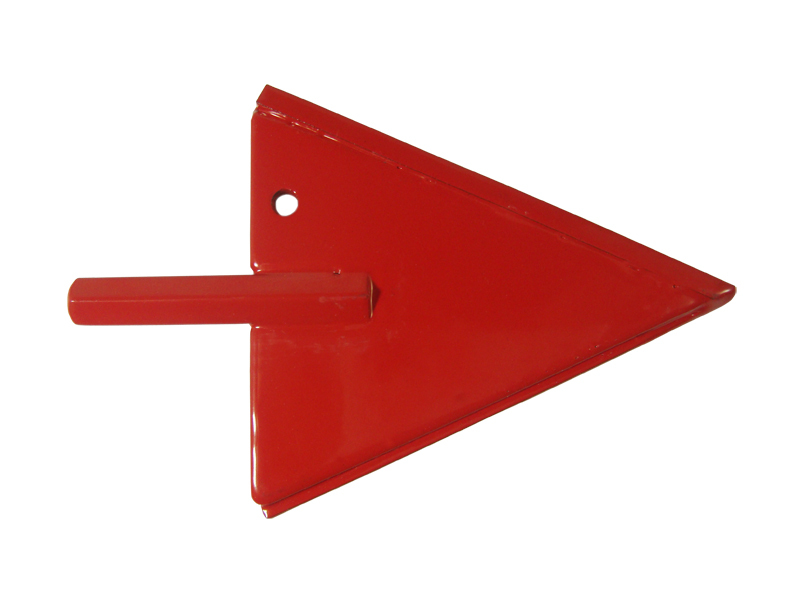 A hole saw is a type of accessory for drills capable of making very large holes in a variety of materials. Most hole saws operate via a central pilot drill that bites into the material first. Then, a cylindrical saw blade of a specified diameter follows it and makes a perfect circular hole. 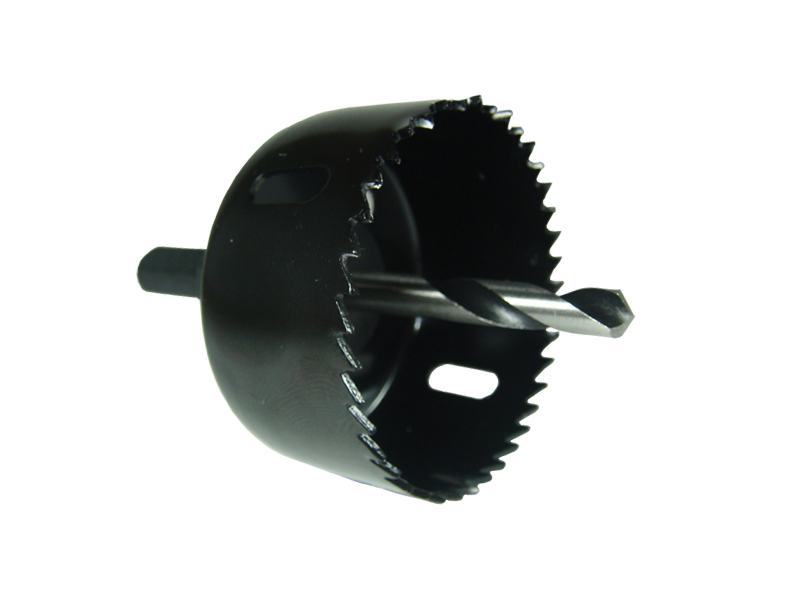 The central hole saw drill bit is part of a detachable accessory known as an arbor. This arbor is simply screwed to the blade before cutting commences. Some larger diameter saw blades feature arbors with two pins that lock into the blade. These pins prevent the arbor locking onto the saw blade if it jams in the work, and allow for tool-free removal. 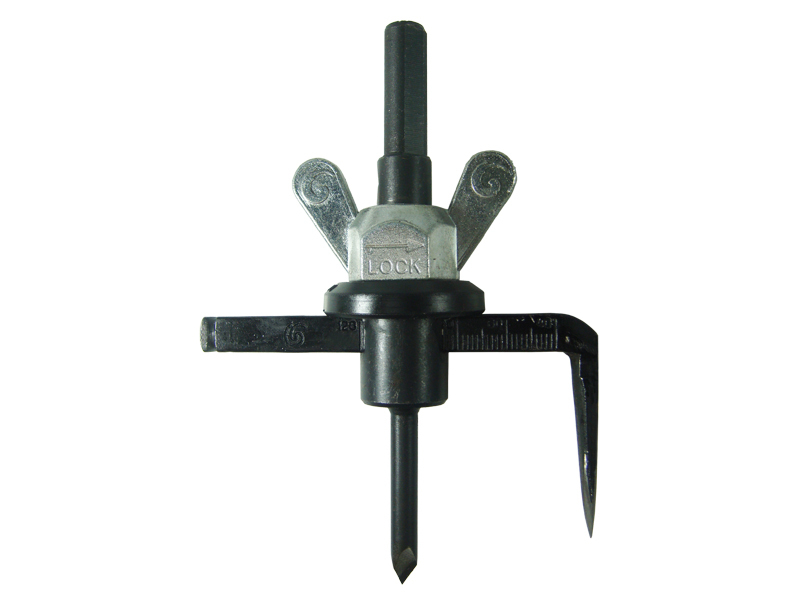 Replacement pilot drills are also available and have a flat section on their shanks for them to be securely fixed in place by a small grub screw. Before you make any purchase, it’s important to make sure that the hole saw’s length (which varies between manufacturers and types) is ample to go completely penetrate the surface you are drilling. Although larger hole saws place substantial loads onto drills, they are not included in a drill’s list of maximum drilling capacities. It is therefore recommended that a corded drill be used for larger sizes and on denser materials. Also, if very slow speeds are required, it is recommended to use a low-geared drill like a high-torque drill (or a two-speed hammer drill put into first gear). Each type of hole saw is capable of cutting a select range of materials, some being far more durable and efficient than others. These are the cheapest and most common type of hole saws. They are made of high carbon steel and are used for cutting large holes in wood, plastics, plasterboard, and soft sheet metal. They are very flexible, but wear the fastest and are easily damaged from excessive heat. The blades either fit up and into a rigid circular arbor, or will be secured onto a central hole saw drill bit. They all usually have a maximum depth of cut of about 25mm. Bi-metal hole saws have high carbon steel bodies and high speed steel teeth, providing both flexibility and durability. This heavy duty shatter proof construction allows them to be used on a very wide variety of materials including steel, cast iron, aluminium, copper, plastics, and wood. They usually have a maximum depth of cut of about 30mm. For a comprehensive guide to the drilling speeds required for bi-metal hole saws, see ‘Operating Tips’ at the bottom of this page. 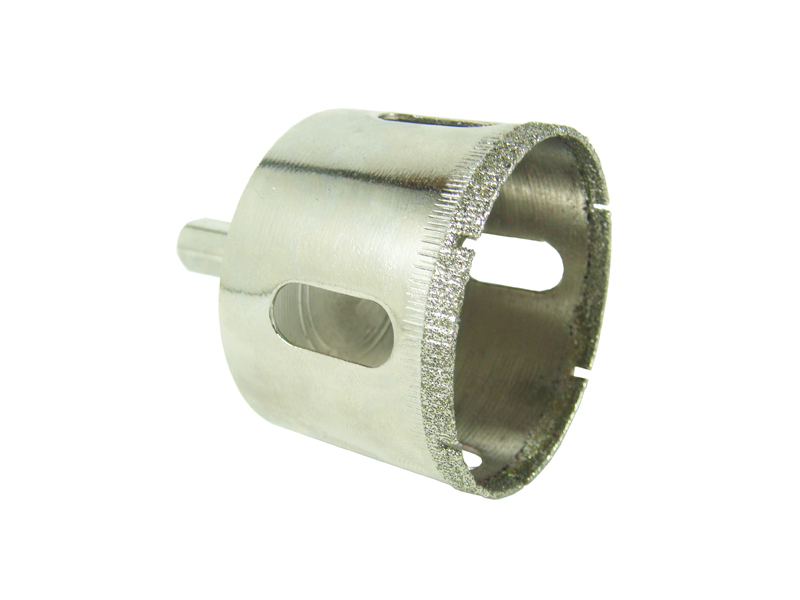 Though bearing only one tungsten carbide tipped (TCT) tooth, these hole cutters are extremely effective in timber and cement sheeting. They can cut up to five times faster than a carbon steel hole saw through wood, but need to be withdrawn frequently to clear any material from the blade and the work. They usually have a maximum depth of cut of about 50mm. High speed steel hole saws leave very clean, round and accurate holes in steel and alloy sheets up to 2mm in thickness (depth of cut does depend on the manufacturer). They are much harder and durable than high carbon steel hole saws, but are’t anywhere near as flexible. They are most commonly used for specialised professional use such as electrical installation work. 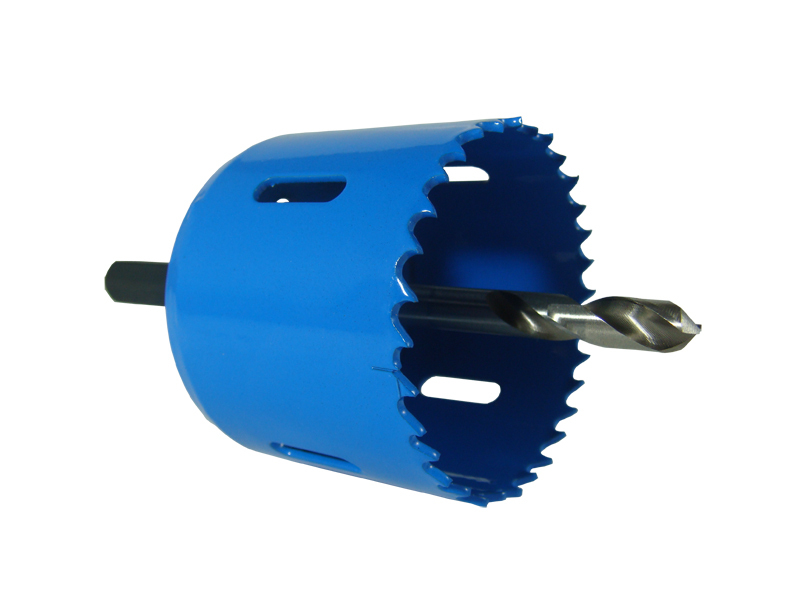 These tungsten carbide tipped hole saw drill bits are designed for specialised cutting in very dense materials. They have the ability to cut up to 2mm thick stainless steel (depth of cut does depend on the manufacturer), and can also perform cuts in steel, fibreglass, glass-reinforced plastics, and other abrasive materials up to 4mm in depth. Again, these hole saws are most suited to professional use. Operating on a similar premise to single tooth hole cutters and TCT hole saws, these hole cutters feature multiple tungsten carbide tipped (TCT) teeth and can be used on a variety of materials, ranging from ceramic tiles to timber and fibreglass. They include both a high speed steel (for wood and fibreglass) and masonry hole saw (for ceramic tiles and cement sheeting) drill bit for use on multiple materials, and can usually cut about about 20mm deep. Although these hole cutters are provided with a masonry drill bit, they should never be used on a drill’s ‘hammer action’ setting. Adjustable hole cutters look quite different from all other hole saws. They are centred by a long steel bit with a sharpened tip, and the cutting blade is in the form of a separate thin, rigid arm (sometimes two) that has a single cutting tooth on it. This arm is easily adjusted to the required diameter by loosening and re-tightening the fixing screw. Upon operation, the arm spins around the centre bit and cuts most hard materials that stand in it’s way, including wood, plastics, vinyl, and rubbers. There is also a tungsten carbide tipped variety that is capable of cutting through ceramic tiles and plasterboard. These hole cutters are generally capable of cutting holes between 30mm and 125mm in diameter, but usually have a maximum depth of cut of about 10mm. Triangular hole cutters take on the shape of an arrow and have tungsten carbide edges designed for drilling holes in ceramic tiles. They can drill up to 75mm diameter holes, operate off very slow speeds and should be allowed to cool every 30 seconds. They usually are usually about 50mm long, giving them enough length to easily drill through nearly all ceramic tiles. After drilling one side of the tile, you will notice a taper to the hole. To remedy this, simply turn the tile over and re-drill the hole. 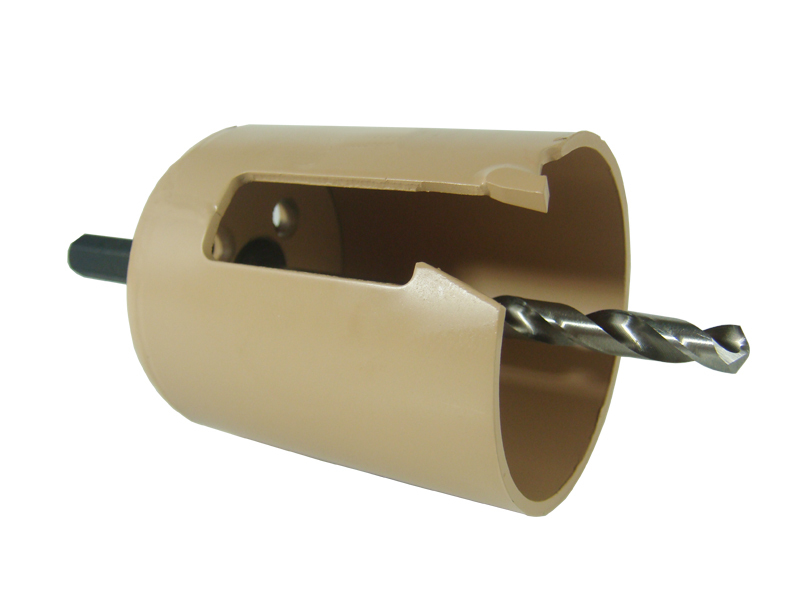 These hole saw drill bits are tipped with diamond grit and are capable of drilling holes through ceramic tiles, hard plastics, fibro cement, and fibreglass. Very similar to diamond drill bits, they are designed to be dipped in water after every 20 seconds of use. There is usually an optional guide that can supply a steady of stream of water and also centre the bits, as they don’t have a centring drill bit. If this guide isn’t purchased, the hole saw must be started on a 45° degree angle to the surface, and once it bites must be moved to 90°. They usually have a maximum depth of cut of about 30mm. Some will also have an arbor attachment available. To ensure efficient cutting, it’s advisable after every cut to remove any material that may be still in the drill bit with a thin piece of metal. 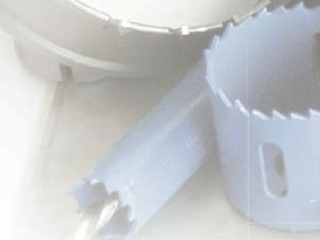 Core cutters are tungsten carbide tipped (TCT) hole saws that are used for boring large holes in masonry. 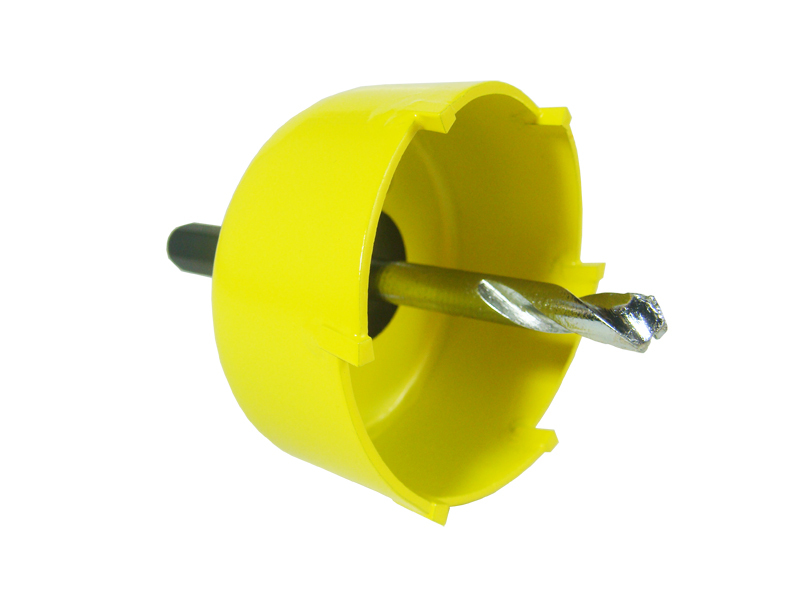 They take a masonry hole saw drill bit and the arbor has SDS (either SDS-Plus or SDS-Max) fitment slots, as core cutters can only be used on a rotary hammer drill. This is because they require the brute force of a rotary hammer drill’s pneumatic hammer mechanism to effectively operate and crumble the core. Maximum drilling depths vary greatly across manufacturers but start from about 30mm. There are a few pointers that, when followed, will preserve the life of any of the above hole saws. All hole saws should be lifted frequently to clear any swarf and allow increased air flow to cool the blade. When cutting metal, cutting fluid must always be used (with the exception of brass and iron). Always ensure the saw blades are sharp to ensure less load on the power tool and better cutting results. It’s advisable to use a centre punch to mark the exact centre point of the hole saw. Similarly, when cutting ceramic tiles, scratch the surface of the tile to ensure the hole saw drill bit centres itself on the correct location. Masking tape may also be used for the same result. Hole saws should generally be used on quite a slow speed to ensure the teeth cut properly and don’t overheat, but this does depend on the specific material being drilled. It is also safe to assume that the harder the material, the slower the speed. However, it is important to consult the hole saw’s packaging for correct operating speeds upon purchase and before use. ‘Bit Diameter’ is measured in millimetres (mm) and refers to the size of hole saw you are using. ‘Cutting Speed’ is measured in metres per minute (m/min) and can be sourced from the below table for the specific material you are drilling. Simply input both the correct bit diameter and cutting speed into the formula and calculate the required RPM for your application.